Minnesota drafted Burdi as a reliever and he’s pitched strictly out of the bullpen as a pro. He throws in the mid- to upper-90s, hitting 103 once in the Cape Cod League. He also has an excellent slider and has occasionally thrown a change. He’s had control issues that he seems to have made progress on at times, but his career has been interrupted by injuries before he’s had a chance to establish himself above class A. After he went out during the 2017 season for Tommy John surgery, the Twins chose not to put him on the 40-man roster and the Phillies selected him in the Rule 5 draft. They immediately traded him to the Pirates for international slot money. The Twins sent Burdi to full season ball after he signed; he got into 13 games in low A and seven in high A. He had some control issues initially, but hitters obviously had serious problems making contact against him. Baseball American ranked him the Twins’ seventh best prospect after the season. Burdi moved up to AA and struggled through the end of July, as he had trouble falling behind in the count. The Twins moved him back to high A until late in the season. He dominated there, then pitched better in a return to AA, although he still walked a lot of batters. BA ranked him tenth in the Twin’s system after the season. Burdi got into just three games at the start of the season, then missed the rest of the year due to a bone bruise on his right humerus. Burdi returned to AA and dominated through 14 appearances, including substantially improved control. He had Tommy John surgery in May, though, ending his season. Burdi opened the season on the disabled list and returned to action in mid-July, working his way up to AAA on rehab. (The maximum rehab, normally 30 days for a pitcher, is 60 days for Tommy John recoveries.) The Pirates called him up on September 1 and he pitched twice during the month. The first game went very badly, but the second went fine. His velocity appears to have recovered, as his fastball averaged over 96 mph in the two outings. Burdi has the potential to be a shutdown, late-inning reliever, so he was a high-ceiling pickup for the Pirates. In the event of injury, a Rule 5 pick has to spend at least 90 days on the 25-man roster. If he falls short at the end of the year, the team can make up the time by keeping him in the majors to start the 2019 season. 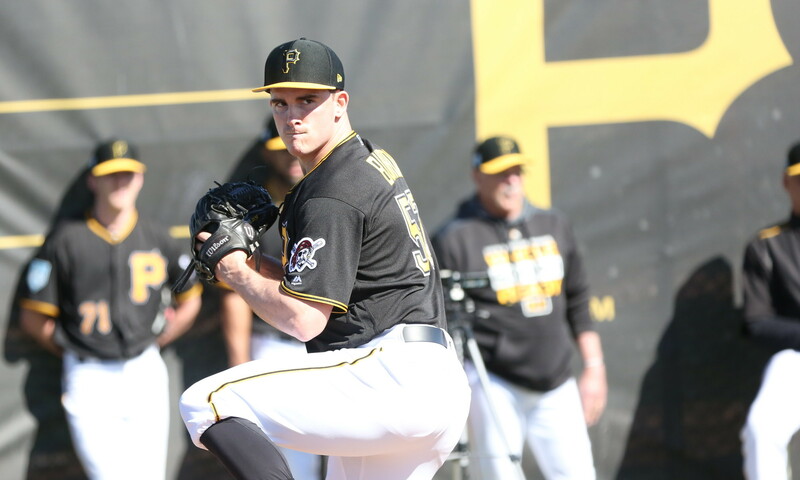 Consequently, to retain Burdi the Pirates will have to keep him in the majors for the first 60 days of the 2019 season. The Pirates haven’t retained a Rule 5 pick since Donnie Veal in 2009. Burdi made their decision easier, though, by having a strong spring and winning a bullpen spot on merit alone. June 8, 2011: Drafted by the Minnesota Twins in the 24th round, 748th overall pick. June 6, 2014: Drafted by the Minnesota Twins in the 2nd round, 46th overall pick; signed on June 24. December 14, 2017: Selected by the Philadelphia Phillies from the Minnesota Twins in the Rule 5 draft. December 14, 2017: Traded by the Philadelphia Phillies to the Pittsburgh Pirates for $500,000 in international bonus pool money.